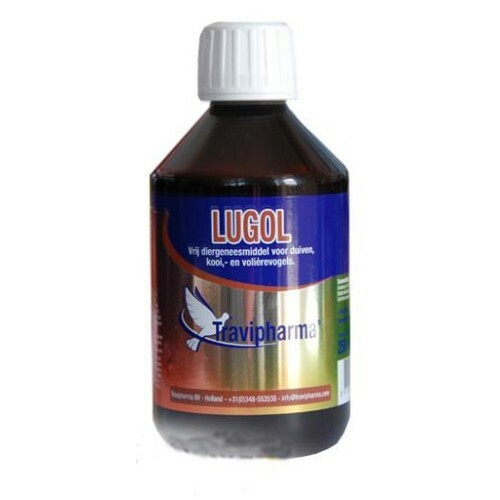 Lugol 250ml by Travipharma is a stimulating tonic for pigeons and caged birds, add to the overall condition of the body, based on fundamental minerals in birds. - Stimulates the vitality of pigeons. - Improving the general condition of the pigeons, bright eyes, nostrils and perfect white throat. - Promotes the growth of young pigeons. - All other natural minerals. - During the sports season, administer 20 drops per liter of water (except shipping day). - During the moulting, breeding and winter, 15 drops per liter.